Dear Readers We are provide all the details related to SSC NWR Recruitment 2017. Staff Selection Commission has published a recruitment notification for the Group B Non-Gazetted & Group C Non Technical Posts. There are total 66 Vacancy of Technical Operator, Junior Chemist & Other. 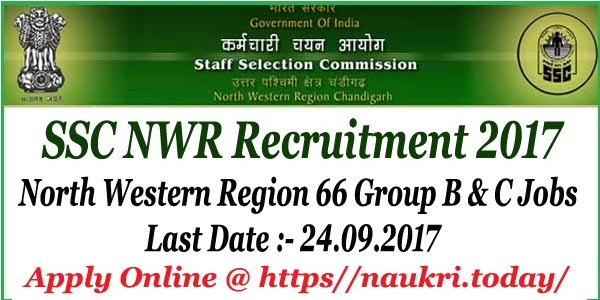 Interested candidates can apply online form for SSC NWR Vacancy on or before 24th September 2017. Further details information regarding education qualification, age limit, selection process, exam pattern, syllabus, for SSC NWR Jobs is mention below. Staff Selection Commission North-West-Region (SSC NWR) : Staff Selection Commission (SSC) is an organization under Government of India to recruit staff for various posts in the various Ministries and Departments of the Government of India and in Subordinate Offices. Recently the Department has issued Recruitment notification of 66 Group B & C Vacancies. Applicants should check Qualification for SSC NWR Vacancy & Apply Online form here. How Much Application Fee Required For Applying SSC NWR Jobs Online Form ? 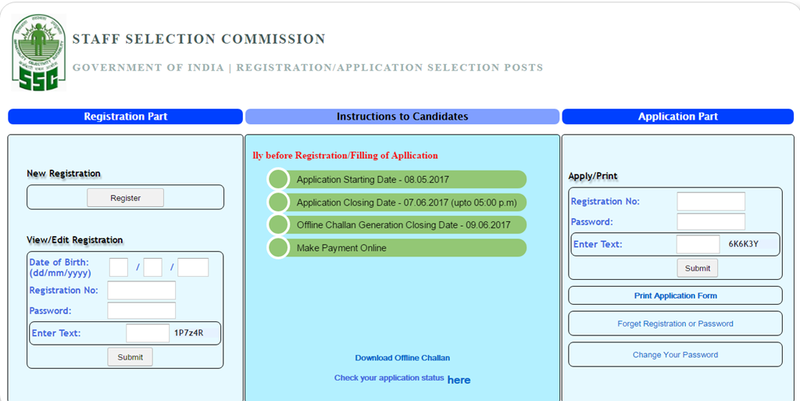 How I Apply Online Form For SSC NWR Recruitment 2017, Group B & C Vacancies Online Form ? What is the Important Dates For SSC NWR Recruitment 2017 For Grpup B & C Jobs ? Applicants who are going to fill online form for SSC NWR Vacancy 2017 should check post wise required Qualification & Other Details from here. Applicants can also check more information about Qualification form official SSCNWR Recruitment Notification which is mention below. Age of the applicants for SSCNWR Vacancy (For Post No. 01 & 03) should be in between 18 years to 27 years. For remaining Vacancy (For Post No. 02, 04, 05, 06 & 07) upper age must be 30 years. relaxation in age is applicable as per Department Norms for SSC NWR Group B Vacancy 2017. Candidate should have done Intermediate or Senior Secondary or 12th pass, Bachelor’s Degree, Master’s Degree in Chemistry & various other qualification. More details applicants should check SSC North Western Region Recruitment Notification & Also Check from below para. Asst Store Keeper & Stockman Jobs : 12th passed Candidates is eligible to fill form for this sscnwr.org Jobs. Farm Manager Jobs : Candidates must have done Bachelor’s Degree in Veterinary Science & Animal Husbandry from any recognized University. SSCNWR Technical Operator Vacancy : Matriculation passed candidates with Hold ITI Certificate in Mechanic or Diesel Mechanic or Fitter Trade for this SSC vacancy. Handicrafts Promotion Officer : Bachelor’s Degree in Fine Arts/ Designs with Work Experience. Junior Chemist : Candidates should have done Master’s Degree in Chemistry/Diary Chemistry/ OIl & Food Technology from recognized University. For Cleaner Posts : 10th Passed Candidates is eligible for this SSCNWR vacancy 2017. Candidates should have to pay of Rs. 100/- (One Hundred only) for non reserve candidates through Online by using SBI Net Banking/ Credit Card/ Debit Card or SBI Challan. No need to pay fees by SC/ ST/ PH/ Ex-servicemen & Women candidates for Filling SSCNWR Recruitment 2017. For Post no. 01 & 03 : For this vacancy candidates will paid pay band under Level 2 Pay Matrix. Post No. 02, 04 : Rs. 9,300/- to 34,800/- with GP Rs. 4,200/- will paid for this SSCNWR Jobs. Post No. 06 : For this Post candidates will paid pay band under Level 1 Pay Matrix. Selection of the applicants for SSC NWR Recruitment 2017 will made on the basis of Computer Based Examination, Skill Test (Typing Test, Computer Proficiency Test & Other). For more information about Selection Criteria you can check from SSCNWR Notification. Eligible candidates can apply online through the website www.ssc.nic.in before the last date & send their online application along with self-attested copies of certificates/ documents. Logon to ssconline.nic.in (SSC NWR Official Website/Apply Online Link). At the last One Important thing Candidates Have to take printout of online application along with relevant documents send to given postal address within 10 days from last date.